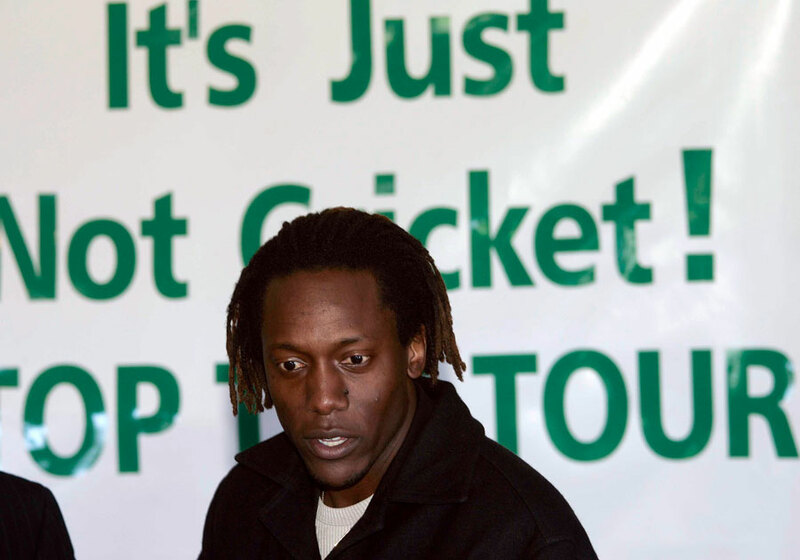 The day Henry Olonga and Andy Flower defied Robert Mugabe's Zimbabwean regime with an act of selfless bravery and huge dignity. By taking to the field wearing black armbands to mourn "the death of democracy" in their country, they achieved the most forceful and eloquent expression of civil rights in a sporting event since Tommie Smith and John Carlos' black-power salute at the Mexico Olympics in 1968. More than anything, their quiet stand brought into focus an issue that had long been overshadowed by sordid squabbles over money and security. Both men were forced into exile and international retirement after the tournament. Namibia made their international debut in the Flower-Olonga protest match. Apart from the black armbands, the game is remembered for Craig Wishart's unbeaten 172 off 151 balls, then the highest score by a Zimbabwe batsman. Rain reduced Namibia's target from 341 in 50 overs to 191 in 25.1, but they only managed to reach 104. They played five more matches in the tournament but failed to win any. They haven't played an ODI since. A mixed day for Dennis Lillee. In the third Test against India, he overtook Richie Benaud's then-record wickets aggregate for Australia (248) but also got involved in an unseemly spat with Sunil Gavaskar, which briefly threatened to bring the Test to a premature end. The match did end early on day five after Australia astonishingly collapsed for 83 against an injury-hit Indian attack. Kapil Dev, who didn't bowl on the fourth evening due to a strained thigh muscle, took 5 for 28 the next morning. With England 2-0 up, the third and final Test - which was also Ian Botham's 100th - against New Zealand in Wellington was drifting away on the final afternoon, and pretty much everyone had switched off - until David Lawrence, fractured his left kneecap as he was about to bowl and fell horribly, his chilling cries of pain echoing around the stadium. Spectators said the sound of his knee splitting was like a pistol shot. His Test career was over, his first-class career as good as, though he did attempt a comeback with Gloucestershire in 1997. As Lawrence was being stretchered off, the England manager, Micky Stewart, and Jack Russell got involved in a scuffle with a local cameraman. Jack Hobbs (178) and Wilfred Rhodes (179) put on 323 for the first wicket against Australia in Melbourne, setting up an innings victory that saw England regain the Ashes. Hobbs' record as an opener is legendary; Rhodes, one of the game's greatest allrounders, began his Test career in 1899, batting No. 11, and ended it in 1930, batting No. 10. A rare overseas Test win for England - their first in ten games, in fact. Darren Gough and the recalled Andy Caddick inspired a rout of New Zealand in Wellington by sharing 15 wickets, while Graham Thorpe made his second consecutive century to nail England's advantage. New Zealand never recovered from a truncated first day, which they closed on 56 for 6. An old-fashioned chunky biffer is born. West Indian Clayton Lambert's five-Test career came in two distinct parts. First he made his debut in the middle order at The Oval in 1991, and it was his preposterous heave off Phil Tufnell's first ball of the third day that kick-started a dramatic West Indian collapse. He was then recalled at the age of 36, again against England, in 1997-98, when he made a hundred. But the following winter Messrs Pollock and Donald found him out, even though Lambert had plenty of experience of playing in South Africa with Northern Transvaal. This time it was terminal - in a sense, though he later appeared for the USA. Birth of the first Englishman to score a Test hundred on debut at Lord's. John Hampshire rescued England from 61 for 5 with 107 against West Indies in 1969, but it was the only hundred he made in eight Tests. A largely attacking batsman, he staged an infamous go-slow at Northampton - which cost Yorkshire a bonus point - as a protest against what he perceived to be selfish batting by one Geoff Boycott. Hampshire later became a Test umpire. England captain Mike Denness ended a wretched Ashes series on a personal high, plundering 188 in the sixth Test, in Melbourne, off an Australian attack weakened by the absence of the injured Dennis Lillee and Jeff Thomson. It remains the highest score by any visiting captain in a Test in Australia and helped England to an innings victory. It wasn't enough to save Denness, however, and within three Tests he had been sacked. Australia won the series 4-1. A Wellington paint-drying marathon. After surviving a strong caught-behind appeal off the first ball of his first Test, John Wright batted 517 minutes and 349 balls for 74 runs in the match. But it was all in a good cause: he was New Zealand's top scorer, and the only man apart from Geoff Boycott to make a fifty in their first Test win over England, in their 48th Test. It still needed England to falter in pursuit of a mighty fourth-innings target of 137. In a match played in gale-force winds, Richard Hadlee (6 for 26) blew them away for just 64. A headline writer's dream is born. Albert "Monkey" Hornby is one of only three men in Test history with a bowling average of 0. He took 1 for 0 off seven overs in his career, which spanned three Tests and five years. Hornby was a batsman by trade, but he failed to reach double figures in six innings. Clearly Monkey wasn't the solution to England's batting puzzle. Birth of Michael Kasprowicz, the Aussie seamer who might have played many more Tests than he did, but for the success of Glenn McGrath and friends. Kasprowicz had success in England in 1997 but was ineffective when recalled in India in 2000-01, and seemed destined to be a nearly man. But he grasped his chance when picked to tour Sri Lanka in 2003-04 and cemented his place in the side with good performances in the return series and in India. In 2004 he took 47 wickets in 13 Tests at 23.74. In 2005 his was the fateful last wicket in the thrilling Edgbaston Ashes Test. Kasprowicz retired in 2008, finishing with 113 wickets from 38 Tests. Ireland medium-pacer John Mooney, born today, missed out on playing in Ireland's famous win over Pakistan in the 2007 World Cup but took four wickets in the bigger victory, over England in the 2011 tournament. Then in December 2013, his ten-wicket match haul against Afghanistan gave Ireland their fourth Intercontinental Cup title. Two months later he left a tour of West Indies due to a stress-related illness. He called it quits in 2015. A captain's knock from Graham Yallop, who made 121 out of Australia's total of 198 against England in Sydney today. Nobody else passed 16, and Yallop's score accounted for 61.11% of his side's innings. It didn't do much for the result, though: England won by nine wickets to seal a 5-1 series victory. Yallop had only one more match as captain before giving way to Kim Hughes.